Home - Archive by category "Energy Efficient Home"
Routine Monthly and Semi-Annual Maintenance Items. Welcome to Yeah, We Do That’s Tip of the week. This week I would like to talk about some items around the house that need routine maintenance. As I list them try and think about when the last time you looked at, changed or had maintenance performed on them. Warmer Weather Is Coming, Is your Home Ready For It? Did you know you need to get your home ready for the summer weather just like you do to prepare for cold weather? Here are some of the things you can do to save on your cooling bills and make your home more energy efficient. Inspect your screens and make sure they are in good shape for days when you want your windows open. Clean and lubricate the tracts the windows slide in, I recommend using a silicone spray lubricant instead of a petroleum based spray. The petroleum based ones will turn black and greasy before long. Inspect the weather stripping as well. Check the condition of your screen door if you have them. Lubricate your door hinges with the same silicone spray. Have your A/C system checked and make sure it is ready to go when you want to turn it on. Make sure you are changing your filters every month as well. If you have window units make sure that the units are in good shape and clean before installing them. Clean the coils and look at the cooling fins on the back to make sure they are not dented. Now that it is warm again and we are moving outside it is the perfect time to check all of your dents on the outside of your home. 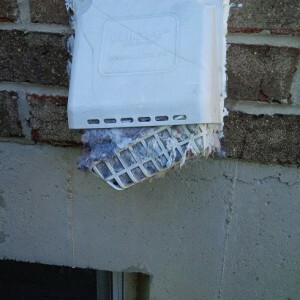 Clean away excess lint from the dryer vent opening (check your vent hose on the inside too!). If your water heater vents to PVC pipe and not up a chimney check the opening outside to make sure it is clear, squirrels have been known to try to use them as storage. If you have not already used your grill you will be soon, inspect it to make sure it came through the winter okay. Clean the grates in hot soapy water with dawn dish liquid, inspect you hoses for cracking and dry rotting. I hope that you have found this article helpful and feel free to share it with your friends by clicking one or more of the social media buttons below. You may also ask a question or leave a comment by clicking the comment button. If you would like to see a How-To guide on a particular topic you can request it by e-mailing me and I will see what I can do. Welcome to Yeah, We Do That’s tip of the week. I am going to talk about the different types of insulation so you can choose the right one for your needs. There is a lot to cover and this topic will span at least two weeks. The first week I talked about the ways you lose your heating and cooling dollars and may be read here.. This week I will talk about the different types of insulation and their applications and the different areas you can insulate.